Blockchain continues to evolve and grow, as more companies test it out. 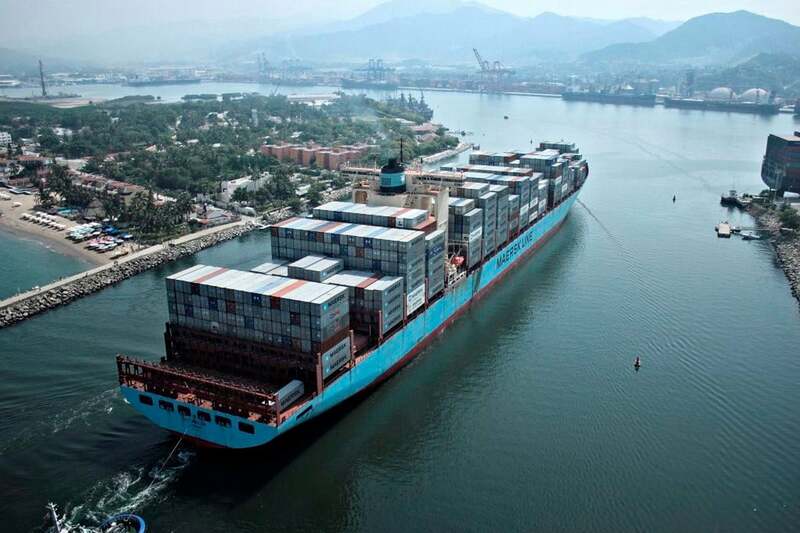 It's now seen as the heart of a new global shipping platform that could save companies billions of dollars and as the underpinning for a P2P cloud storage endeavor. Developers with blockchain skills have become the hottest commodity in the freelance marketplace, according to a new study. 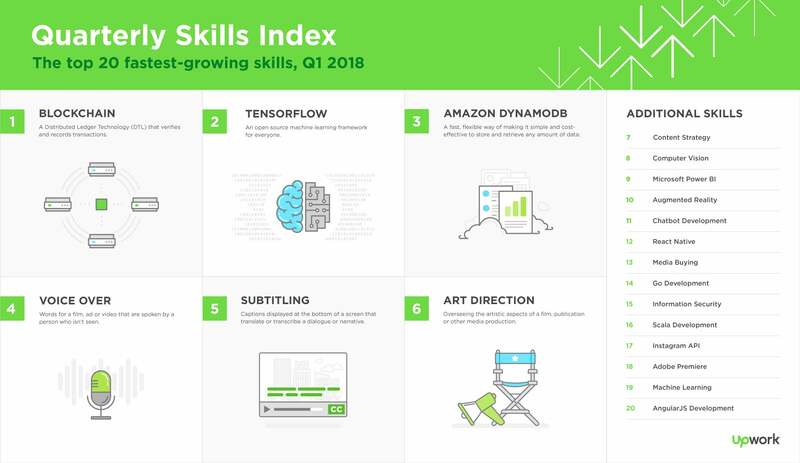 Freelance employment website Upwork released its latest quarterly index of the 20 hottest job skills, which shows that job postings for workers with blockchain skills have grown exponentially this year. In its last quarterly report, blockchain technologists were in second place behind those with skills in robotics. "Blockchain appears to be the next uncharted, highly talked about technology similar to what the 'cloud' was back in the mid-2000's," the Upwork report says. "Its growth exceeded 2,000% for three quarters in a row on Upwork.com, and in Q1 it experienced more than 6,000% year-over-year growth, making it the fastest-growing skill out of more than 5,000 skills on the site." According to another recent report from Upwork, 53% of hiring managers surveyed cite access to skills as their biggest hiring challenge, and the majority (59%) are already utilizing flexible talent. 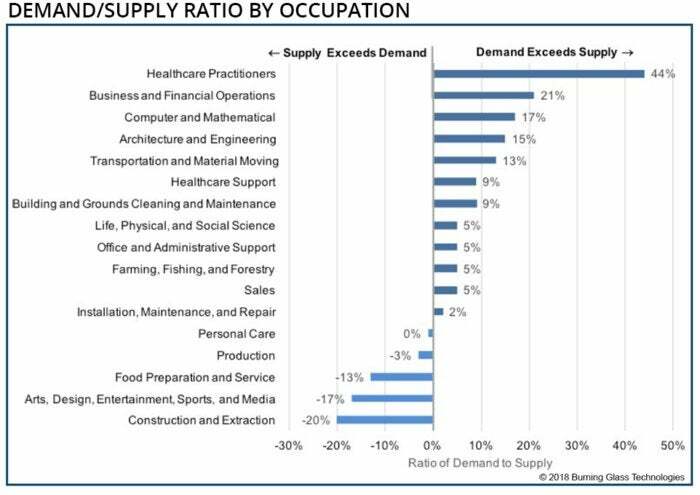 Demand for workers with computer/mathematical skills exceeded supply by 17% this year, according to job data analytics firm Burning Glass Technologies. There were 5,743 mostly full-time job openings calling for blockchain skills in the last 12 months, according to Burning Glass Technologies; that represents a growth of 320%. The initial hype around blockchain has evolved as more enterprises take the distributed ledger technology seriously, according to Upwork. "Major companies such as Samsung and IBM are already leveraging it in innovative ways, while Salesforce is planning on unveiling a blockchain offering for its customers during Dreamforce in September," the report said. Bitcoin cryptocurrency developers were in third place for freelance skills in Upwork's previous quarterly report, but those technologists have since dropped out of the top 20 job skills list. Meanwhile, blockchain technologists are advertising their services for as much as $250 per hour, according to Upwork's listing site. The median income for fulltime blockchain developers in the U.S. is $140,000 a year, compared to general software developers, whose annual median pay is $105,000, according to Matt Sigelman, CEO of Burning Glass Technologies. In high-tech regions of the U.S. such as Silicon Valley, blockchain developers earn as much as $163,000; in New York City, they can earn as much as $150,000, according to Sigelman. "Most of the demand for blockchain developers is still concentrated [in high-tech regions]," Sigelman said. It's not hard to imagine blockchain as a "disruptive skill" that is both fast-growing and hard to find, according to Burning Glass. While the technology and hiring patterns are in their early stages, employers need to start figuring out where they will find blockchain talent, "even as they are still considering how the technology will change their business. "Because of its connection with 'cryptocurrencies,' blockchain is associated with finance, and major banks like Liberty Mutual, Capital One and Bank of America have posted openings," Burning Glass Technologies said in its blog. "There are also companies devoted to building blockchain applications, like Consensys Corporation. 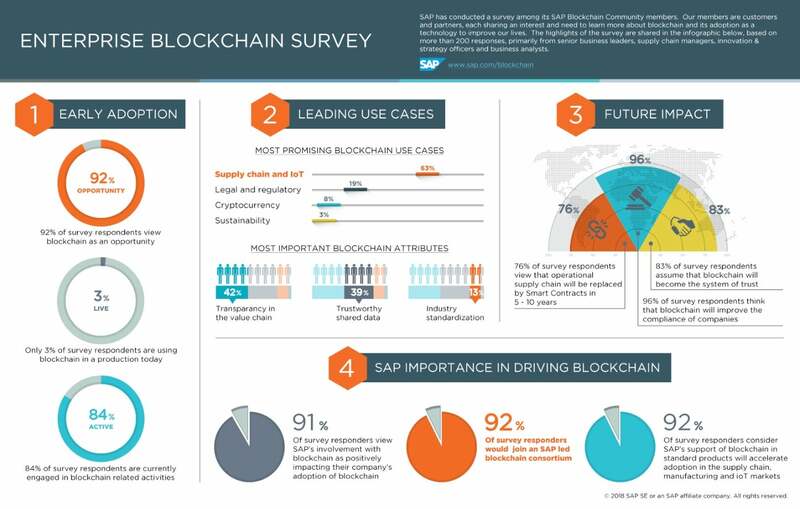 But the demand for blockchain is much broader, including major consulting firms like Accenture and Deloitte and technology companies like IBM and SAP. "This is additional evidence that the business world is starting to take blockchain seriously." CME Group Inc., for example, announced this week it plans to launch bitcoin futures. Cryptocurrency market capitalization has grown in recent years to $172 billion, with bitcoin representing $94 billion, or more than half of the total, according to CME Group. Gartner forecasts the business value-add of blockchain will exceed $3.1 trillion by 2030, indicating that it shows promise in terms of utility for business and is a technology that’s here to stay, the Upwork report said. Additionally, the World Economic Forum just released a toolkit to help executives better understand whether blockchain is an appropriate and helpful tool for their business needs. As more executives try to navigate this technology, there is soaring demand for talented experts familiar with it who can help demystify it and explore potential uses, Upwork noted. Enterprises are considering the ways blockchain distributed ledgers can create more efficiency by eliminating the need for central administration, as is required with a relational database. Enterprises are also asking their tech vendors about blockchain for audit logging and/or verifiable logs, which is viewed as a reliable way of tracking what happened in an organization to satisfy regulatory auditors, according to Zulfikar Ramzan, CTO of RSA Security, a subsidiary of the Dell EMC Infrastructure Solutions Group. "It's a very hot topic right now," Ramzan said in an earlier interview with Computerworld. "We are definitely getting a lot of inbound inquiries around blockchain and its implication within enterprise environments. I think it's driven largely by the fact that when there's a new technology out there, to some degree people want to be buzzword compliant with the latest and greatest." The 20 fastest-growing freelance skills in the first three months of 2018 saw more than 130% year-over-year growth in demand, while demand for the top 10 skills grew more than 400% compared to the same time period last year (Q1 2017). Banks are moving toward blockchain in droves for its ability to create an open, cross-border system for clearance and settlement of financial transactions. IBM, for instance, has built a new blockchain-based financial service for use as a cross-border currency exchange by several banks. Last year, IBM partnered with a Polynesian payments system provider and an open-source FinTech payment network to implement a new international exchange based on the blockchain electronic ledger. The ledger will serve 12 different currencies across Pacific Islands as well as Australia, New Zealand and the United Kingdom. Mastercard is launching its own blockchain-based network to enable partner banks and merchants to make cross-border payments faster and more securely. The Mastercard blockchain service can be used to clear credit card transactions and eliminate administrative tasks using smart contract rules – thus, speeding transaction settlement. JP Morgan Chase last October rolled out a blockchain pilot program for global payments. The financial services giant said the blockchain-based Interbank Information Network "will enhance the client experience, decreasing the amount of time – from weeks to hours – and costs associated with resolving payment delays." Blockchain is an electronic ledger – similar to a relational database – that can be openly shared among disparate users to create an unchangeable record of their transactions, each one time-stamped and linked to the previous one. It can also be used as a private electronic ledger. Blockchain can only be updated by consensus between participants in the system, and once new data is entered, it can never be erased. The blockchain contains a true and verifiable record of each and every transaction ever made in the system. While blockchain skills initially showed up in artificial intelligence and automation fields, they've now spread into other, more traditional roles, such as software developers, financial quantatitive analysts, and network engineers. "What's interesting here is what we refer to as the hybrid-job economy; that's the notion that increasingly jobs are combining skill sets. If you look at some of the jobs growing the fastest and are highest value to companies are those with a sort of mixed-skill genome," Sigelman said. For example, mobile app developers may be asked if they have marketing and commerce skills that web developers aren't typically expected to have. "And, blockchain is having a lot of the same characteristics for some reasons that aren't all that surprising becuase it's a foundational technology and fundemental re-think of the underpinnings of how we transact and connect," Sigeman said. The path to becoming a blockchain developer is relatively simple, said Sigelman, who has noticed online courses being offered by universities, such as Princeton, UC Berkeley and Stanford. For example, Stanford University's Coursara, its venture-backed education-focused technology company, is offering online courses. Many companies seeking blockchain developers are advertising for workers with Java Script and Python language coding experience, which are standard software skill sets. Others, however, are looking for developers with skills in cryptography and machine learning, Sigelman said. "I think somebody who is on the leading edge of software development is not going to feel like these blockchain skill sets are new ground for them," Sigelman said. While fiinancial services (see Bitcoin) was the first industry to jump on board the blockchain wagon, industries such as technology service providers, international shipping, healthcare, power utilities and real estate have been quick to explore its use, too, for everything from smart contracts that automatically execute when certain conditions are met to controlling security access to sensitive control systems. IBM Watson Health and the U.S. Food and Drug Administration are exploring the use of blockchain for secure patient data exchange, including sensitive electronic medical records, clinical trials and data culled from mobile devices and wearables. Blockchain is also making inroads into industries as diverse as retail sales, administrative services, transportation and warehousing, where it's being used as way to manage distributed supply chains. Karim Lakhani, a professor of business administration at the Harvard Business School, compared blockchain's impact to that of the Internet because it creates an open, distributed network that allows anyone to share data in a secure manner. "Settlement of [stock trades] takes time because you're going from one system to the next... and it can take days and cost a lot to transfer money across the world and across multiple systems...versus a direct message system on a network," Lakhani said. "If we have an open, distributed ledger where we can verify transactions taking place and we can build in a programmed logic of how actions take place, that the reduction in transactions costs and increase in the number of new novel applications that can be developed far outweighs the purported benefits of relational database systems." "It's a whole new paradigm for the way information is stored, shared and acted upon," Lakhani added.